Apple cider vinegar is one of the popular folk remedies for psoriasis. Natural vinegar has a beneficial effect on the skin and has a soothing effect. It disinfects damaged areas, removes toxins, eliminates itching and burning. It reduces painful sensations that come with psoriasis, leads to the skin improvement and the restoration of the affected tissues. In addition, this remedy has antiseptic, bactericidal and antifungal action. 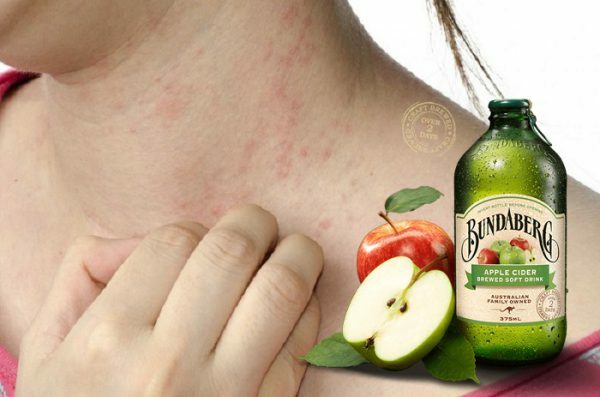 When applying apple cider vinegar for treating psoriasis, it is recommended to give up alcohol, cigarettes, consumption of salt in large quantities, spicy and fatty foods. oral intake (within 2 weeks, drink a glass of water before eating a meal with 1 tbsp vinegar). When fighting psoriasis, you should use apple cider vinegar cautiously. Otherwise, there is a risk of drying the skin (and in case of ingestion – it can cause irritation of the internal organs). To prevent this from happening, it is necessary to rinse the skin with water after each procedure. After this, it is desirable to apply a neutral moisturizer (eg, vegetable oil). Apple cider vinegar and any medications on its basis cannot be applied to open and bleeding wounds.